Professor Mawutor Avoke was born on July 1, 1963. He attended seven primary schools before proceeding to Mawuli School, Ho, where he had his secondary and sixth form education from 1976/77 to 1984. He moved on to the University of Ibadan, Nigeria for his B. Ed and M.Ed. in Special Education graduating in 1989 and 1991 respectively. He later pursued a Diploma in Education and a PhD from the University of Birmingham, England United Kingdom in 1994 and 2003 respectively. His teaching experience expands over 23 years of University teaching (including undergraduate and postgraduate levels teaching), and one (1) year at the College of Special Education Mampong, Akwapim. He also taught as a supply teacher for two (2) years in more than ten (10) Secondary /Special Schools in the United Kingdom. Professor Avoke rose rapidly through the ranks, progressing from Assistant Lecturer, (1992-1994); Lecturer, (1994-1998); Senior Lecturer, (1998-2003); Associate Professor, (2003-2005) to Full Professor in 2005. At a relatively young age of 39, he had been promoted to the rank of Associate Professor of Education. By the age of 42 he had become a full Professor of Education. Professor Avoke was elected Pro Vice Chancellor of the University of Education at the age of 44, a position he served for four years. He is the only person to have served two terms in the history of the University of Education, Winneba in that capacity. 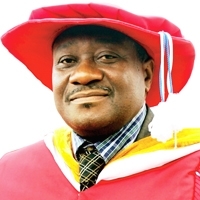 Prior to his appointment as the third Vice-Chancellor of the University of Education, Winneba, Professor Avoke, held several administrative and academic positions; some of which were: Pro-Vice-Chancellor ( 2008 to 2012); Dean, School of Graduate Studies; Dean, Faculty of Educational Studies; Dean Faculty of Science Education for a semester; Director, National Centre For Research into Basic Education (NCRIBE); Deputy Director, of NCRIBE: Head, Department of Special Education on two different occasions; Head, Mental Retardation Unit; Coordinator, School Attachment Programme in the Department of Special Education; Examination Officer, Department of Special Education; Coordinator, Special Education courses for Mampong and Kumasi campuses,; Coordinator for school attachment programme, Department of Special Education. He is currently the Chairman of the Governing Council of Ho Polytechnic; Chairman, Standing and Finance Committee and Entity and Tender Committee, Ho Polytechnic; He is also the Chairman of the Governing Council of Akim Oda University College. Additionally, Professor Avoke is a member of the National Inspectorate Board of the Ministry of Education, Ghana. Other Committees and Boards he has served on and some he continues to serve include: the Governing Council of the University of Education, Winneba, Member, (2005-2012), a representative of convocation on two different occasions and later as Pro-Vice-Chancellor; Chairman of Convocation of the University College of Education, 1998-1999; Member, Grant Steering Committee, 2008-2012; Member, Finance Committee, 2005-2011; Member, Appointments and Promotions Board, 2005-2008; Chairman, Time Table Committee, 2008-2012; Member, Development Committee, 2008-2012; Chairman and Member, Joint Admission Board, 2005-2012; and Member, Committee Responsible for Monitoring University’s Strategic Plan, 2005-2007. Member, Publication Board, 1996-1999;Chairman and Member, Graduate Board, 2005 to date; Chairman and Member, Scholarship and Conference Committee, 2005 to date; Chairman and Member, Academic Planning Committee, 2005 to date; Member, Executive Committee, 2005 to date; Member, Finance and Development Planning Committee, 2005 to date; He has been the Chairman, School Management Committee, since 2004 to date. He was the Chairman of the 20th Anniversary Celebration Planning Committee of UEW, as well as the Chairman of the 20th Anniversary Implementation Committee of UEW. Additionally, Professor Avoke served on the Search Committee for the appointment of Principal, Mampong, Kumasi and Ajumako campuses (2012- 2014); Search Party for the appointment of head teacher of the University Basic School, University of Ghana, Legon (2008);Search Committee for the appointment of the University Librarian (2013); Member of the Committee set up to review the structure of the current Basic Education Programme at the University of Education, Winneba (2007); Member: Committee responsible for reviewing all University Proposals for Teaching and Learning Innovation Fund and proposals for funding ( 2006-2010); Member: Committee responsible for reviewing subject combination at the University College of Education( 1996). A 3- Member UTAG Committee to review the University Statutes (2006). Prof. Avoke was for four years a Member of the Professional Board, Institute of Education Advisory Board, UCC, (2008 to 2012); a Member, Jim Bolton Agriculture Senior Secondary School Board of Governors (2009 to date); a Member, MiHa Educational Trust Fund, Effutu Municipality (2009 to date); a Member, SWEP Foundation, a Non-Governmental Disability Organisation (2012 to date). He was also a leader of the University of Education, Winneba’s delegation that did part of the negotiations with the Ghana Education Service for the transfer of the Ajumako Campus to the University of Education. In the editorial field, Prof. Avoke has offered his services in various capacities including: Managing Editor, Journal of Business Research, University of Professional Studies, Ghana, (2012 to date); Advisory Member, Journal of Business Research, Nigeria (2010 to date); Editorial Board Member, International Journal of Home Economics Research, (2010 to date); Member, Editorial Board International Journal of Basic Education, Nigeria, (2009 to date); Editorial Committee Chairman, First Sub-Regional Education Summit on Special Education, West and Central Africa (2012). He is a Peer/Blind Reviewer of the British Journal of Special Education and a Member of the Editorial Board, International Journal of Technology and Management Research, Koforidua Polytechnic from 2012 to date. He is also a Chief Editor of the Journal of Interdisciplinary Studies from 2005 to date. Prof. Avoke has received several honours and awards on the national and international level.He was co-recipient of the National Media Feature of Children Award by the National Media Commission and UNICEF for his outstanding contribution to issues of children in the media and the welfare of children. He is also a commonwealth Scholar and a recipient of an oversea Development Agency Award by the British Government. He was also a visiting Scholar to the School of Education, University of Sussex. During the 60 anniversary celebration of the Department of Special Education, University of Ibadan, Nigeria, he was invited to give the key note Speech as special invited guest and an illustrious alumni of that Department. In 1998, as a very young lecturer, and the Ag Head of Department, he led the Department of Special Education, University College of Education to be adjudged the best department in publication, organisation and leadership. Between 2004 and 2012, Prof. Avoke was instrumental in several fund raising programmes/activities for the Department of Special Education for capacity building, and the University. He also acted as consultant to many projects in the University, particularly at the National Centre for Research into Basic Education; some of those projects were: the Sesame Project, the Girl Child Education Project, and HIV Alert School by UNESCO. Developing Training Manual project, sponsored by the African Development Bank and Ministry of Education. Professor Avoke is External Examiner and Assessor to many institutions including the University of Ibadan, University of Lagos, University of Calabar and the University of Cape Coast. He has also successfully supervised more than 150 undergraduate Project works, thirty (30) Masters of Education, Dissertation, Twenty Six (26) MPhil theses, and Ten (10) PhD Theses. Clearly he has thus reproduced himself ten times, but continues to actively supervise PhD and M.Phil. students. Professor Mawutor Avoke is a very motivated individual who has the capacity to inspire and motivate others. He has a broad range of experience in teaching, research and community service and a huge capacity to provide academic leadership and mentorship. He has mentored many young faculties within the University. The profile of staff in the Department of Special education is one case in point. He is a team player, good listener and communicates effectively with very good interpersonal skills. He has provided consultancy in many ways and to numerous institution including the Home office, United Kingdom, assessment for placement of pupils in special schools in Ghana, Montessori Schools and Learning Centres; Equal project on disabilities in Ghana. Professor Mawutor Avoke is married to Dr (Mrs.) Edinam Kakra Avoke, a senior lecturer in the Department of Art Education and currently the Acting Head of that department. They are blessed with four children, Yaaya, Kafui, Sena and Selorm.